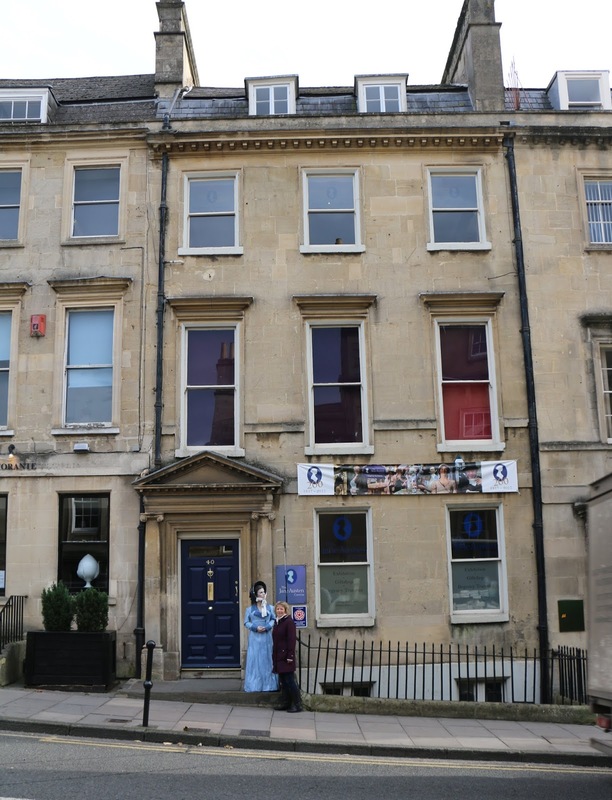 If you want to learn about Jane Austen, my favourite author and one of Bath’s most famous residents, the Jane Austen Centre is an excellent place to start. I recently visited the centre to talk to their social media manager, Jenni Waugh, about my book, What Regency Women Did For Us, which features Jane Austen. You can find my interview on the Jane Austen website here: An interview with author Rachel Knowles. For those of you who have never visited the Jane Austen Centre, here is my guide to what you might discover there. Where is the Jane Austen Centre? The Jane Austen Centre is at 40 Gay Street in Bath. It is situated in a Georgian townhouse much like the one Jane once lived in, just up the road at number 25. 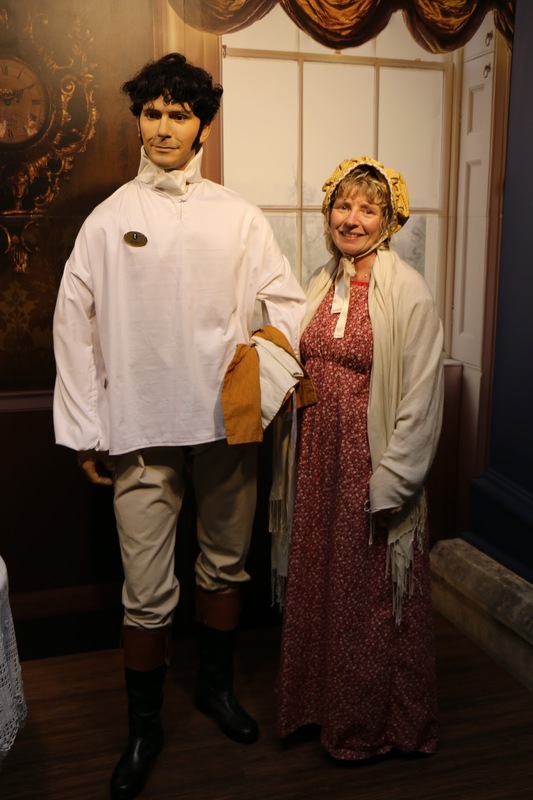 Visitors to the Jane Austen Centre are transported back 200 years as they are welcomed at the door by the much-photographed figure of Martin Salter, dressed in Regency costume. Within the centre, all the staff are in Regency costume – even the man operating the till. 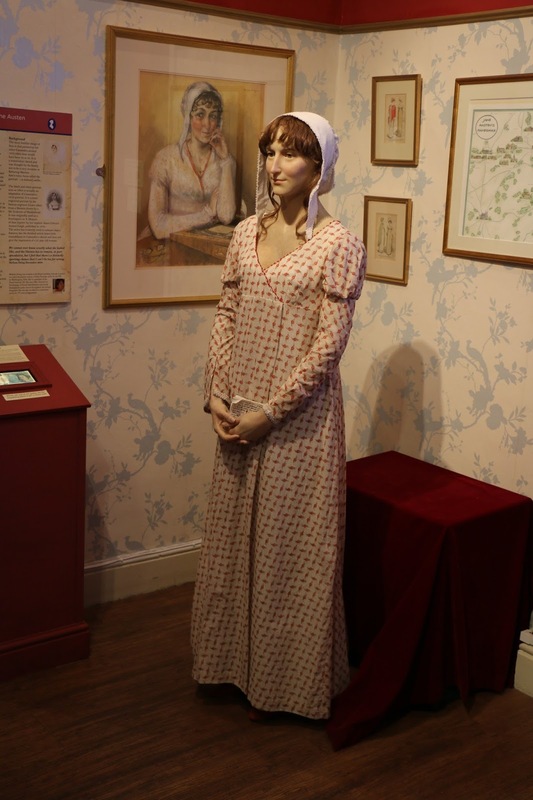 The tour starts upstairs with an introductory talk about Jane Austen by one of the centre’s costumed guides, who each take on the persona of one of Jane Austen’s characters. 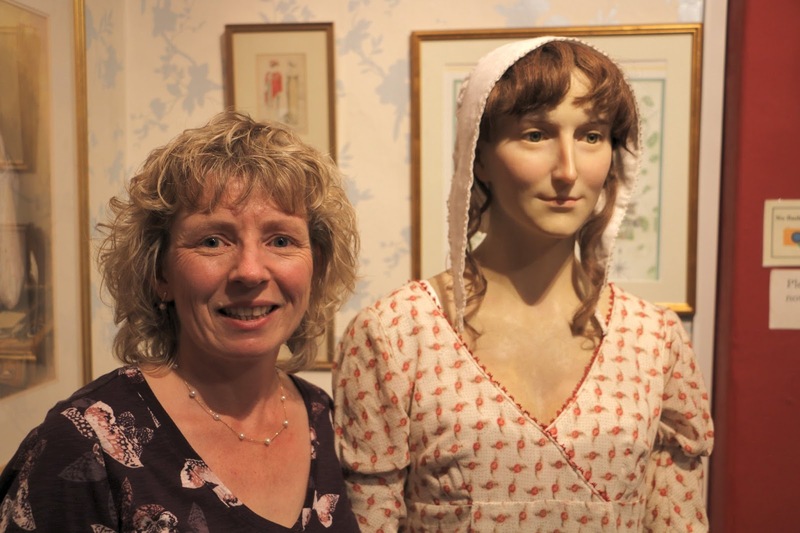 Our talk was given most proficiently by ‘Georgiana Darcy’, who introduced her audience to Jane and the Austen family, and told the story of Jane’s life. The main exhibition is on the ground floor, starting with a corridor of Jane Austen pictures which our guide talked about. 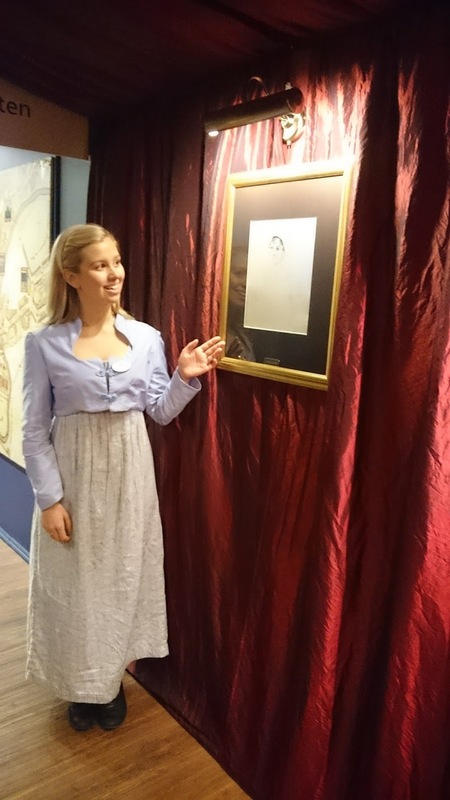 Sadly, none were original, but the reproduction of Cassandra’s famous sketch of Jane Austen did have the advantage of being somewhat larger than the original, which is in the National Portrait Gallery in London. 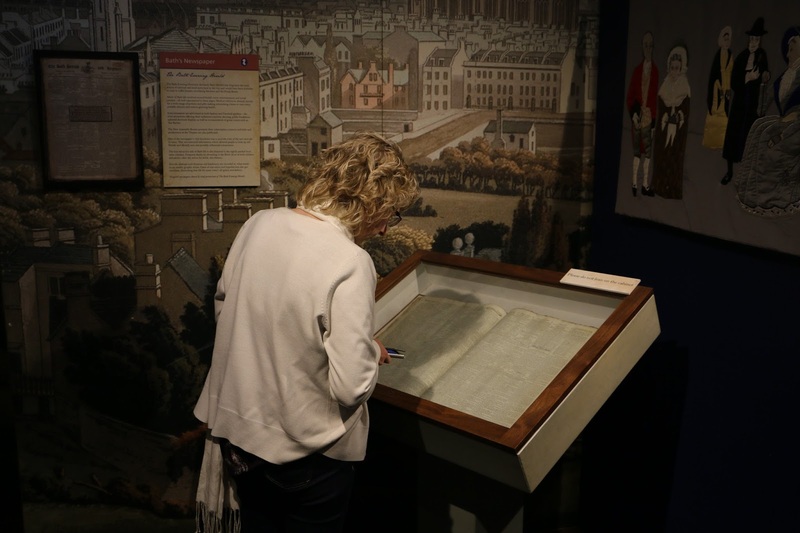 Throughout the exhibition, there were display boards giving information about the houses in which Jane lived in Bath and other facts about her family, her loves, and the life she led. If you are a fan of the 1995 BBC adaptation of Pride and Prejudice, then you will recognise Adrian Lukis, the presenter of a short video detailing the places in Bath that Jane was associated with. Adrian played the charming but villainous George Wickham. 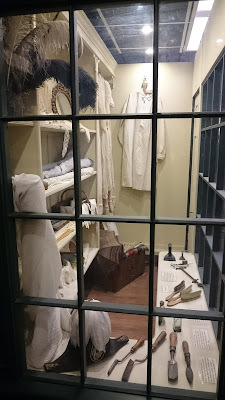 One of the most fascinating exhibits was a little shop, filled with items you might have found in a milliner’s shop in Georgian England, including glove stretchers and feathers. As well as displaying various Regency costumes, there was the chance to dress up. 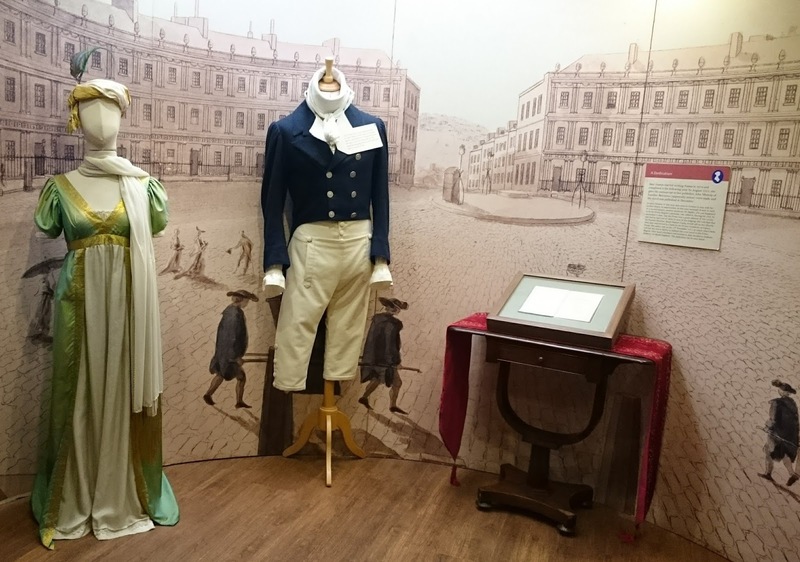 Visitors can choose from an array of Regency gowns, gloves, shawls and hats, and pose with the model of Mr Darcy. Moving on, there was a chance to practise writing with pen and ink, and discover how hard it is to write without blotting ink all over your paper. 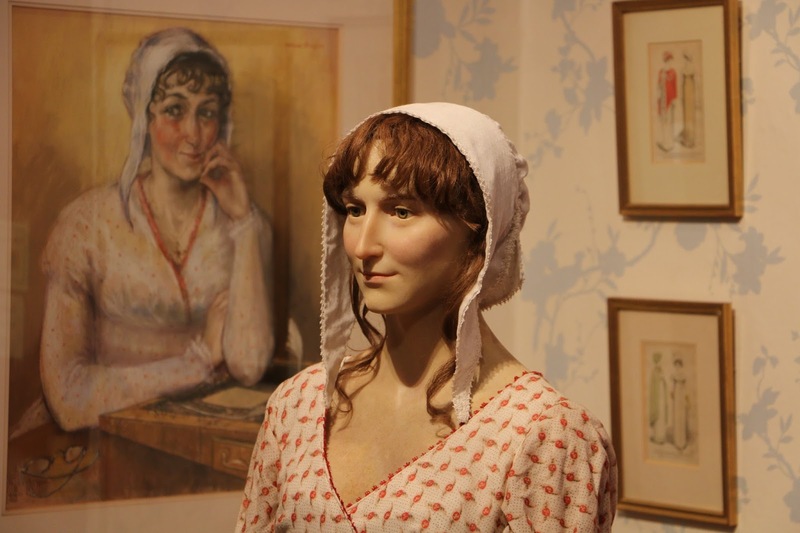 Finally, the pinnacle of the exhibition – the life-size, waxwork figure of Jane Austen based on forensic artist Melissa Dring’s speculative portrait. I have wanted to see this waxwork, created by sculptor Mark Richards, whose clients include Madame Tussaud’s, ever since I first read about it. The most surprising thing for many people is the revelation that Jane was quite tall. 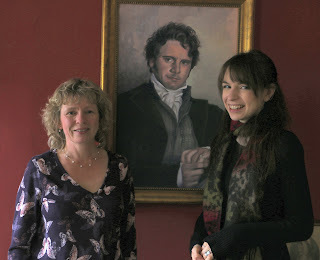 As you will see from the photo of Jane and myself, she is by far the taller of the two. I believe Jane’s height was worked out from a pelisse she once owned, showing her to be around 5 feet 6 inches tall. Alongside the statue is another piece of Jane Austen memorabilia: one of the five new polymer £5 notes depicting a miniature engraving of Jane’s face on it, together with a quote from one of her books. 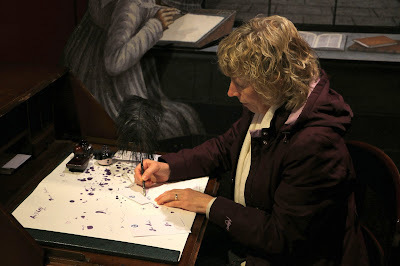 Artist Graham Short made the engravings, and he donated this £5 note to the Jane Austen Centre in Bath to go on display. 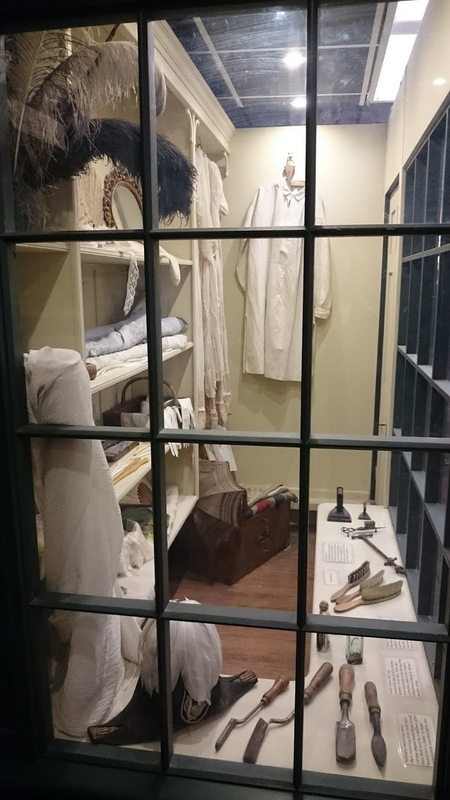 After visiting the exhibition, you can browse the gift shop, where you can purchase all manner of items related to Jane Austen, many of which have Mr Darcy’s name or face on them. 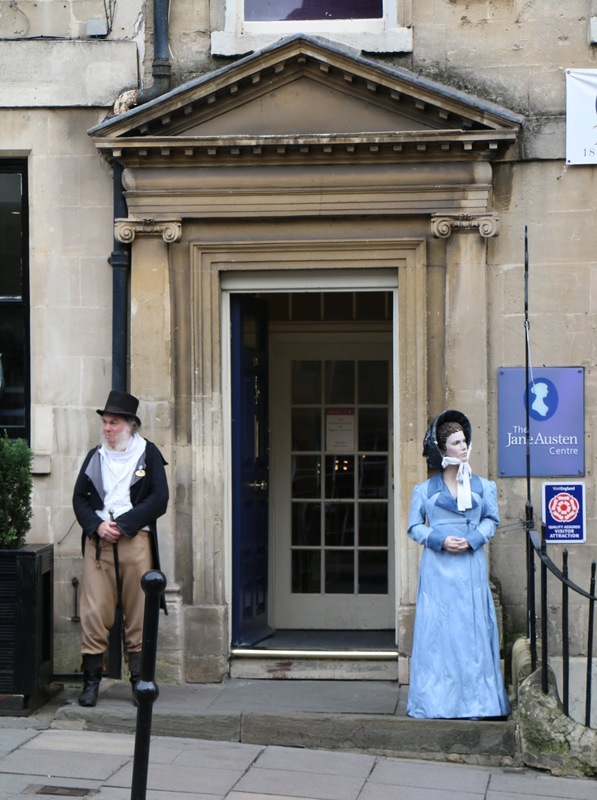 If you want a reminder of what you’ve learned at the centre, the souvenir guide is full of facts about Jane Austen’s residence in Bath, and includes a family tree and timeline, as well as a Regency tour of Bath. You can finish your tour where I started mine, right at the top of the house in the Regency tearooms, where Jenni Waugh interviewed me. 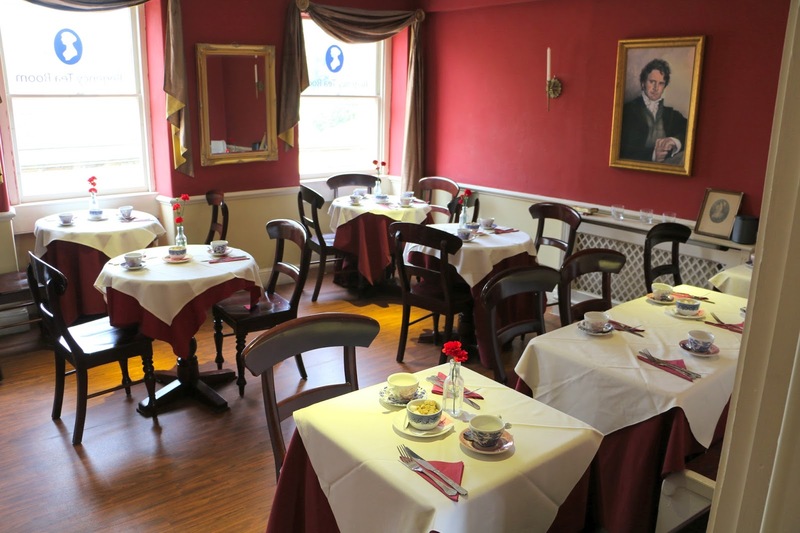 Here you can sip tea, served by staff in Regency costume, while admiring the portrait of Mr Darcy, as depicted by Colin Firth in the BBC’s classic 1995 dramatization of Pride and Prejudice. Probably not, but don’t let that put you off. 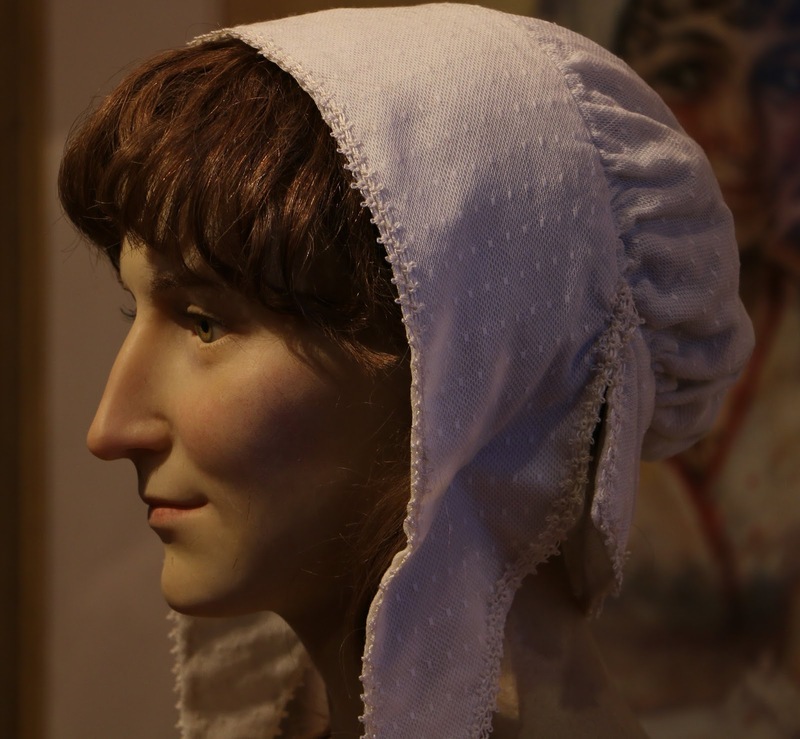 I knew a lot about Jane Austen before my visit as I wrote about her in What Regency Women Did For Us, and I would have found it quite disturbing if I had discovered a lot of new facts that I wish I had included! Did I enjoy my visit? Yes, I enjoyed my visit very much. 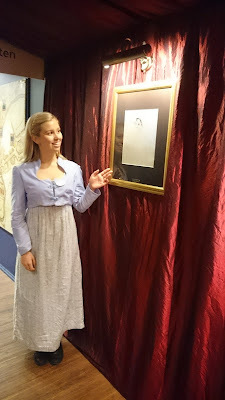 It is always a pleasure to talk to other Jane Austen enthusiasts, and the costumed guides at the centre could probably have talked with me about Jane Austen all day. The highlight of my visit was undoubtedly seeing the Jane Austen waxwork. 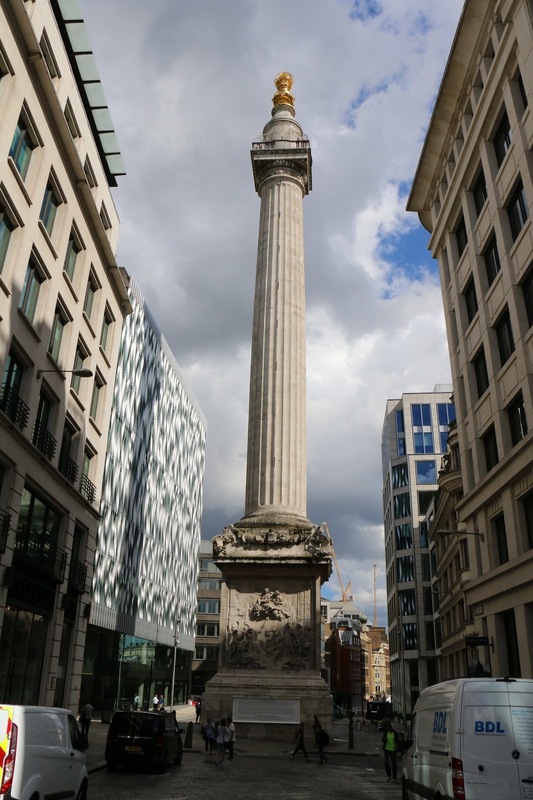 The Monument is … well … a monument. Specifically, it is a monument to the Great Fire of London of 1666 and the rebuilding of the city. It is a Doric-style stone pillar, 202 feet tall, situated 202 feet away from Pudding Lane where the Great Fire started. The Great Fire of London raged from 2-5 September 1666. The fire started at the house of the king’s baker in Pudding Lane and the wind caused it to spread rapidly. While it raged, the fire destroyed thousands of houses and more than 80 churches, including St Paul’s Cathedral. Very few lives were lost, but a large area of the city was burnt down. 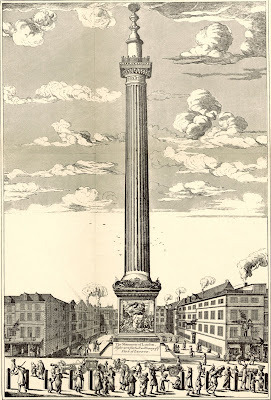 Sir Christopher Wren, Surveyor General to Charles II, designed the obligatory commemorative pillar in conjunction with his colleague, Dr Robert Hooke. Wren also designed many churches that were rebuilt after the fire, including, most famously, St Paul’s Cathedral. 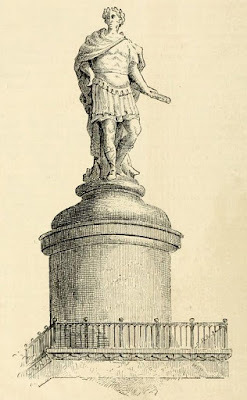 The existing design was agreed upon after plans for a pillar surmounted with a phoenix or a statue of the king were dismissed as too costly and unsuitable. 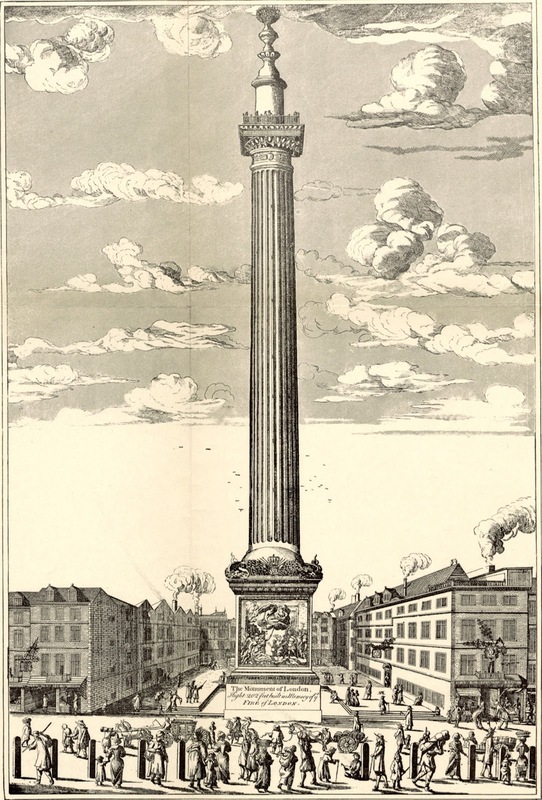 The resulting memorial was a Doric column made of Portland stone supporting a drum and a copper urn containing flames representing the Great Fire. It was built in 1671-7 on the site of St Margaret’s Church, off Fish Street Hill, the first church to be destroyed by the fire. 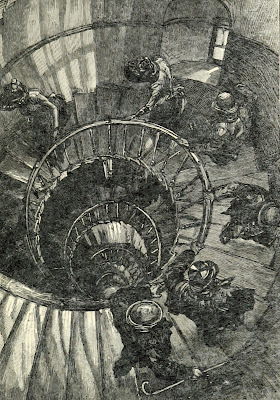 Inside the Monument is a cantilevered stone staircase which leads to a viewing platform, 160 feet above street level. 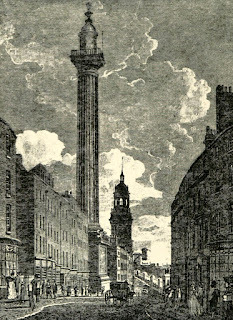 The inscription on the north side of the pedestal states that the total height of the Monument of 202 feet is equal to the distance eastward to the house in Pudding Lane where the fire broke out. 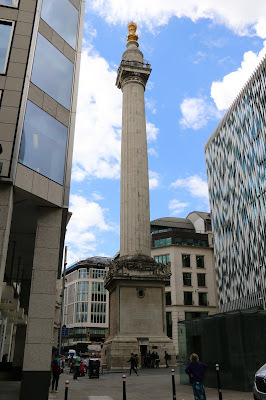 About 20 yards north of London-bridge is situated the finest pillar in the world, erected by Sir Christopher Wren, in memory of the great fire, which, in 1666, broke out at a house on this spot, and destroyed the metropolis, from the Tower to Temple Bar. 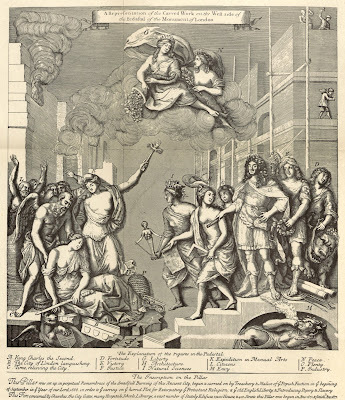 The short inscription blaming the Catholics for starting the Great Fire of London was added in 1681 as a result of the anti-Catholic feeling engendered by Titus Oates and the Popish Plot. The objectional lines were removed by order of the Court of Common Council dated 6 December 1830. The Georgian guidebooks and Welch’s History of the Monument concur that there were 345 steps. I am perplexed as to what has happened to the other 34 steps. 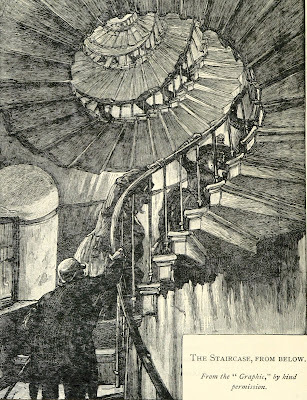 Has the staircase been rebuilt at some stage? Is the viewing platform lower now than it once was? I have been unable to find anything that explains why the number varies so greatly. Can anyone solve the mystery for me? On 18 November 1852, four artillery men of the Royal Artillery were stationed on the Monument in order to pass signals from St Paul’s Cathedral to the Tower on the occasion of the funeral of the Duke of Wellington. In 1750, a dreadful accident occurred. A weaver named William Green leaned too far over the railings of the balcony to look at an eagle which was kept in a cage there and fell over the edge to his death. During the years 1788 to 1842, six people committed suicide from the Monument, including Lyon Levi, a Jewish diamond merchant, on 18 January 1810. 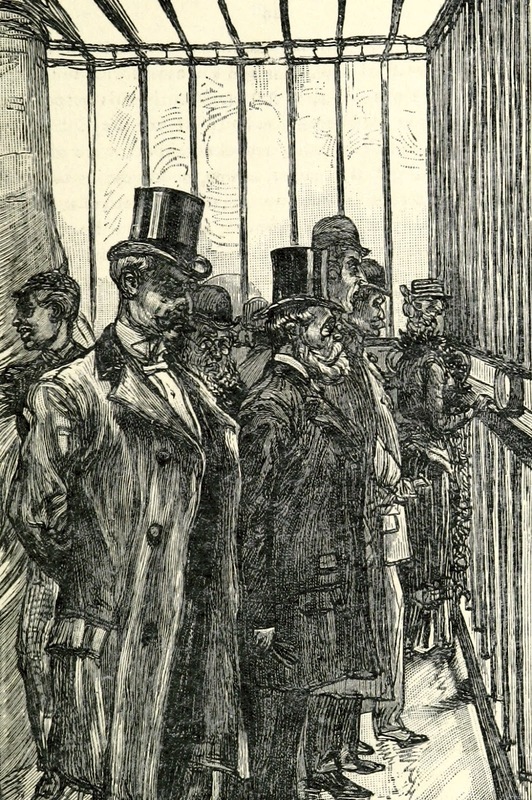 To prevent further tragedy, the building was temporarily closed in August 1842, and before it reopened, the gallery was enclosed with an iron cage. The Monument has been renovated approximately every 100 years with the latest comprehensive restoration programme taking place in 2007-9. The stonework was cleaned and repaired, the urn re-gilded and a new gallery cage installed. 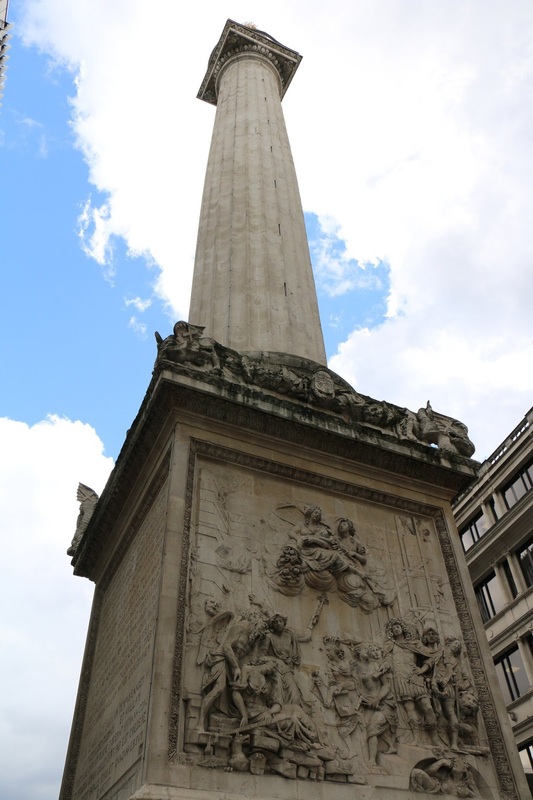 The Monument is open to visitors all year round except 24-26 December. You may have to wait for entry at busy times as a maximum of 33 people are allowed inside at one time. 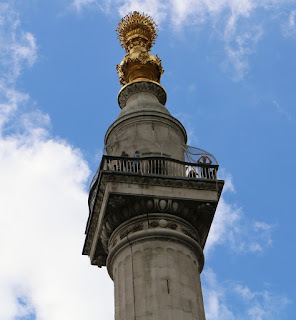 It is also highly unlikely that you will beat the time of a lad who ran up the Monument and down again in 2 minutes 32 seconds in 1732, for a wager. The stairs can get quite busy with people going up and down and you need to be prepared to stop regularly to allow people to pass. However, this does give you a chance for a breather as you make the long climb. 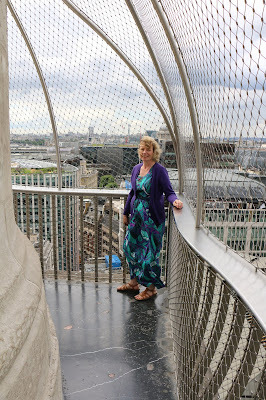 If you succeed in climbing the 311 steps, you will be rewarded with fine views of London from the balcony. 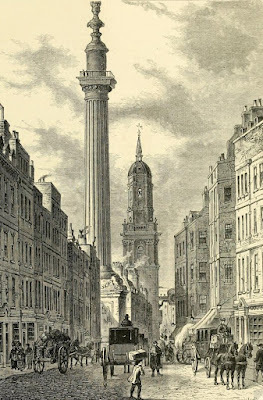 (1) From Welch, Charles, History of The Monument with some account of the great fire of London, which it commemorates (1893). (2) From Welch, Charles, History of The Monument with some account of the great fire of London, which it commemorates (1893). (3) From Feltham, John, The Picture of London for 1810 (1810). (4) From Feltham, John, The Original Picture of London 26th edition (1829). (5) From Feltham, John, The Original Picture of London 26th edition (1829). (6) From Crosby, B, A View of London; or the Stranger's Guide through the British Metropolis (Printed for B Crosby, London, 1803-4). (7) From Thornbury, Walter, Old and New London: A narrative of its history, its people, and its places (Cassell, Petter & Galpin, 1873, London) Vol 1. (8) From Thornbury, Walter, Old and New London: A narrative of its history, its people, and its places (Cassell, Petter & Galpin, 1873, London) Vol 1. (9) From Feltham, John, The Original Picture of London 26th edition (1829). 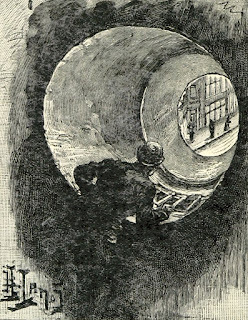 (10) From Thornbury, Walter, Old and New London: A narrative of its history, its people, and its places (Cassell, Petter & Galpin, 1873, London) Vol 1.